After last year’s shows in Cambridge, at the Outside the Box festival, and our thrilling run at the NY Musical Theater Festival last year, Icarus returns! Liars and Believers are now Artists in Residence at A.R.T.’s Oberon, and Icarus will fly in that fantastical space May 1-11. Details and tickets here! See Minnie Minoseczeck’s Menagerie of Marvels, a show of amazements and abominations, rising up from the dustbowl of the Great Depression! See Passionate Penny fly through the air! Experience the genius of the great inventor! Face the Monster’s Maze. Hear the mellifluous music of Icarus! Watch them try to escape monsters and machinations of all kinds and see it all come crashing down! MINNIE MINOSECZECK’S MENAGERIE OF MARVELS IS NOT RESPONSIBLE IF YOU GOT A WEAK HEART. 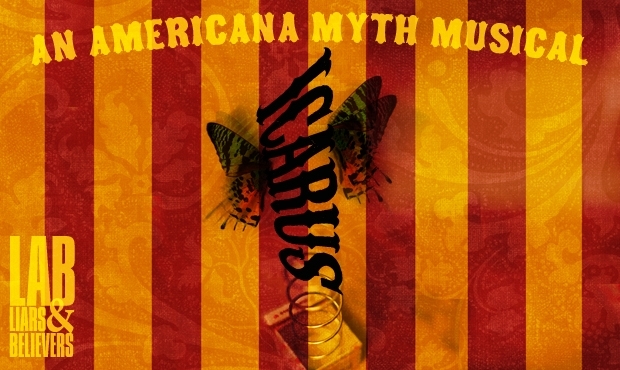 ICARUS features an original Americana score by Nathan Leigh (Song of Songs) and the fantastical puppetry by Faye Dupras. 02 Apr	This entry was published on April 2, 2014 at 2:42 pm. It’s filed under Music, My Work, Theater and tagged A.R.T., Icarus, Liars and Believers, Oberon. Bookmark the permalink. Follow any comments here with the RSS feed for this post. Newer: Songs from Vinegar Tom!